Seven year-old Maya Shakeshaft raised £1,400 for Upton Junior School’s SOS Pool appeal through a sponsored swim. 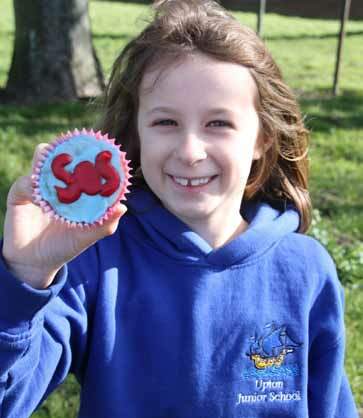 Staff and pupils at Upton Junior School in Kent have launched an SOS Save Our Swimming Pool campaign in a bid to raise vital funds to repair their pool before it is closed permanently in July. The pool was forced to shut temporarily before Christmas in need of essential repairs – the cost of which is estimated to be £100,000. The school has applied for grant funding from a number of sources, but the majority of the money must be raised through fundraising and support from the local community. The school launched the SOS Pool appeal earlier in the year which has so far raised £15,000 through sponsored events and activities. Seven year-old Maya Shakeshaft managed to raise £1,400 for the appeal through a sponsored one mile swim with her parents. “The pool needs a whole new air-conditioning system, it also requires work on the roof and steelworks, a new electrical system and new pipework,” explains Dave Walker, assistant headteacher at Upton Junior School. “These are the absolute basics before we install a new pool liner and a changing room refurbishment. “The children are all so desperate to do their bit to save the pool,” Dave adds.